If you haven't heard juicing is trending! Claims have been made that drinking fresh-pressed juices can help you lose weight, boost immunity, prevent cancer and cleanse your system. Juice is the easiest way of getting a lot of fruits and vegetables into your system. There are two main types of juicer – centrifugal (the most popular and the cheapest) and masticating (also known as cold press juicers). The Omega Nutrition Center Juicer is a Commercial Masticating Juicer (also referred as low speed juicer) equipped with a powerful single gear motor of 2 HP and rotation speed of 80 RPM and auto-pulp ejection for continuous operation. The unit's dual-stage juicing system ensures maximum efficiency, while its low rotation speed means no foaming, no clogging, and no heat build-up. This masticating juice extractor thoroughly chews up plant fibers to fully extract vitamins, enzymes and minerals from fruits and vegetables. Low speed processing protects and maintains healthy enzymes, prevents oxidation and allows juice to be stored up to 72 hours without degradation. Other highlights include a high juice yield with very dry pulp, heavy-duty construction, compact with four stabilizing feet, and quiet operation. Nutrition Center has multiple utility features and are not just limited for juicing – they can make healthy and nutritious ice creams from frozen fruits, turn nuts into nut butter, extrude pasta and dough, grind coffee beans and spices, mince herbs and garlic, make baby food, and whip up milk in a flash. However, this healthy center comes with its own set of drawbacks like – Noticeable plastic dust particles on auger and juicing screen, plastic parts wear and tear easily, clogging of pulp in inner screen and small feed chute. Overall, the Omega Nutrition Center Juicer is highly recommended kitchen companion for those perfect, delicious and healthy drinks and snacks. The quality features juicer is backed with a 15 years warranty and is considered to be better and healthy than centrifugal juicer. The Hamilton Beach 932 is brilliantly simple, commercial manual citrus juicer with classic-looks and effective performance. Created with rack-and-pinion gearing that allows you to exert up to 2,000 pounds of pressure with very moderate effort, the unit extracts maximum amounts of juice from small to medium sized lemons, limes, oranges, blood oranges, grapefruits, tangerines and even pomegranates. 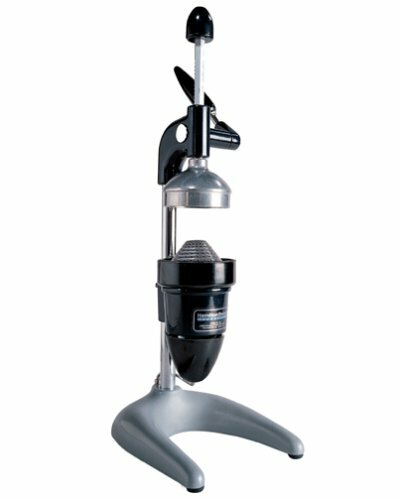 Designed for rugged use, the juicer has a heavy-duty metal construction with acid-resistant chrome and enamel finishes. The easy to remove and clean strainer cone is designed to hold the pith, pulp, peel and oil free making juicing fun and effortless for children and elderly people. 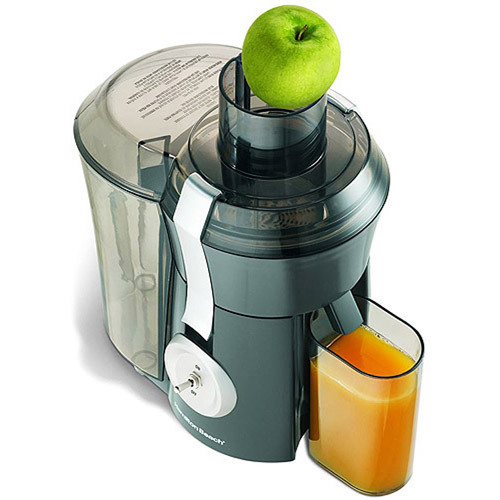 The juicer's handle stays in the up position, which makes it easy and quick to add more fruit while juicing. A swing-out drip cup at the bottom is adequate for small citrus fruits; it also swivels to the side to make way for glasses up to 5-1/2 inches high and swings back into place to collect drips. Its Sure Grip non-skid base keeps it still while protecting the counter-top. It is suitable to a heavy-duty cafe; kitchen or a high-volume coffee counter. However, some reviewers have noticed rusting of the drip cup. Also, some reviewers would like to see the plastic parts replaced with steel parts and a bigger sized drip cup. Overall, the Hamilton Beach 932 Citrus Juicer is a must have manual juicer for anyone craving for a healthy snack. It is a commercial juicer and is backed with 1 year limited warranty. 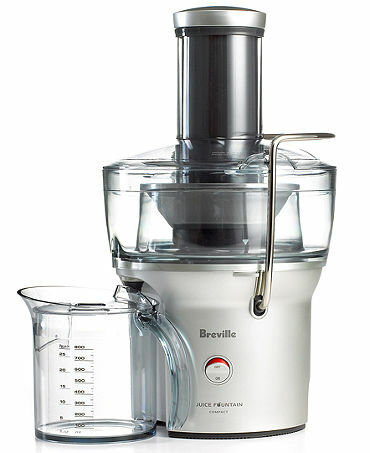 Breville BJE200XL Compact Juice Fountain delivers all the power and performance expected from a centrifugal juicer. The 700 watt fast and powerful motor operates at 14,000 RPM for maximum extraction of 250 ml (8 oz) of juice in mere 5 seconds. The unit features a stabilizing dual knife assembly, which centers fruits and vegetables over the cutter and filter forcing them against the stainless steel micro-mesh filter. The filter and cutter are powerful enough to extract good quantity juice leaving the pulp dry. The unit also features a large 3 inch centered feed tube that allows juicing whole fruits and vegetables quicker and faster. The unit collects pulp within the footprint of the unit and juices 1.5 quarts of juice before it needs to be emptied. All removable parts clean up quickly by hand or are dish washer safe. This unit also includes a 1 liter juice jug. 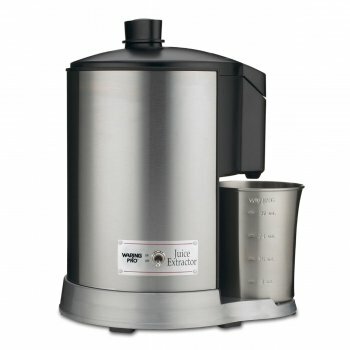 However, though this unit is a great entry level juice extractor, many reviewers mentioned some common concerns. One such major issue is the cleaning process. It has multiple parts to clean but the tedious of them is the mesh basket as the pulp sticks in the wires thus forcing one to invest more time and energy to clean. It is advised to clean the unit immediately after juicing to avoid dried pulp and easy clean-up. 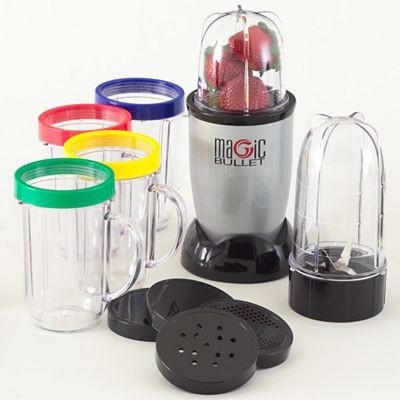 Due to the fixed high speed of motor, the soft fruits and veggies do not grind properly. Also if the pulp catcher is not emptied every time, the juice leaks from the sealed plastic lid. 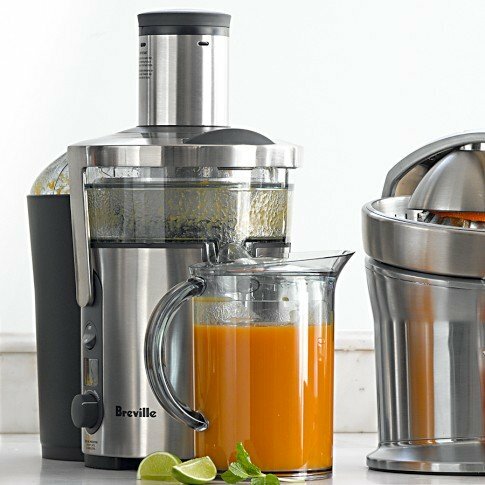 Overall, the Breville BJE200XL Juice Fountain is packed with power, providing heavy-duty performance in a space-saving design. The Jack LaLanne Power Juicer is an exclusively modern juicer available. It features patented extraction technology that gives you up to 30% more juice than other juicers. A super-sized detachable pulp container and a whisper quiet 2,500 RPM induction motor makes juicing quick, quiet and efficient. 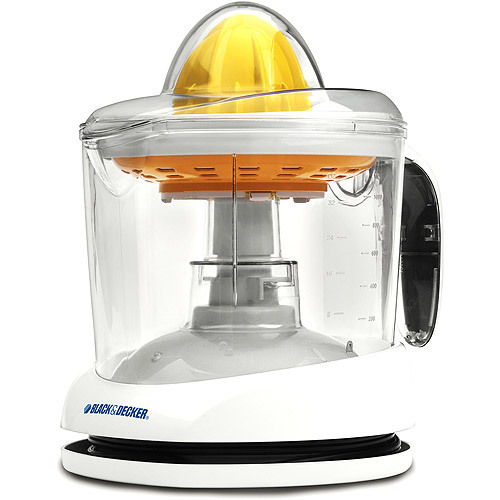 This power juicer is also dishwasher safe and has a surgical quality stainless steel blade. 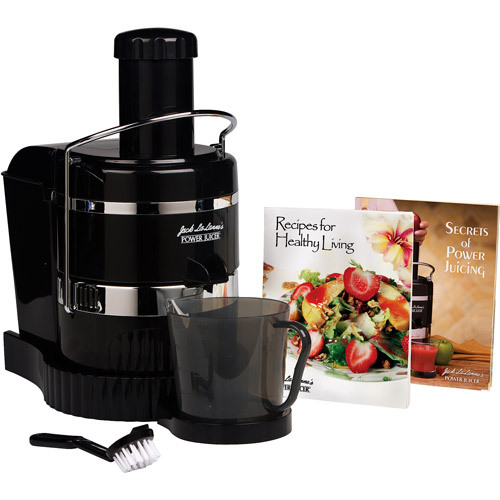 The Jack LaLanne Power Juicer includes the power juicer platform, a measuring cup, filter brush, over flow platform, and Jack LaLanne's Secret of Power Juicing and Recipes for Healthy Living. Many users say that taking this juicer apart for cleaning is time consuming. Many users say that taking this juicer apart for cleaning is time consuming. Though many find it easy to clean with the help of the brush, still it is advisable to clean immediately after the juicing to reduce the time taken. It comes with an open spout on top which spills out some juice, which adds to cleaning work load. 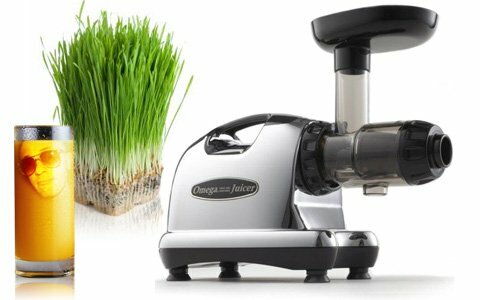 Overall, the Jack LaLanne Power Juicer is decent entry level juicers for its easy to use features and affordable price. The Black & Decker CJ625 Citrus Juicer helps you prepare fresh-squeezed citrus juice right when you want it. Get all the juice you need without the seeds that are filtered out by the two self-reversing cone and strainer provided with the juicer to squeeze every drop of juice. The small cone squeezes more juice from small fruits like oranges, lemons and limes, while the large cone is perfect for grapefruit. You can even regulate the amount of pulp that goes into the juice with the adjustable pulp control feature. The standard-size cone of this Juicer can accommodate a variety of citrus fruits and its large capacity lets you prepare family-size juice portions quite easily. The built-in cord storage keeps the cord neat and out of way. This easy-to-clean Citrus Juicer is dish washer safe and comes with a drip-free spout for serving ease. Overall, the Black & Decker Citrus Juicer is highly recommended for its ease of use and unbeatable price. It is perfect for youngsters, singles, families or elderly individuals for a quick healthy snacking and is backed with 1 year limited warranty. Waring Pro Health Juice Extractor comes with commercial-quality stainless steel blade and powerful 550-watt motor, which mean quick and efficient juicing of fruits and vegetables. The extractor's die-cast base stays steady on the counter-top, and its cushioned feet minimizes vibration, protecting the counter-top from scratches. The major advantage of this unit is it eliminates constant worry about stained yellow or orange plastic parts. This unit has an extra-large 31/2” feed chute and 32 oz. capacity and a safety interlock system that ensures operation won't start until lid is securely in place. With the Waring Juice Extractor cleaning won’t be an issue as the compact strainer, pulp collector, lid and juice collector are all dishwasher-safe, and the stainless-steel body wipes clean with a sponge. However, it was noticed that this unit leaves a considerable amount of wet pulp while juicing. However, it was noticed that this unit leaves a considerable amount of wet pulp while juicing. This unit is fairly noisy and the pulp container fills up pretty fast. This unit does not come with an external pulp collector and the pulp is stored on top of the unit and it has to be emptied or rinsed couple of times if juicing more than 25 ounces. 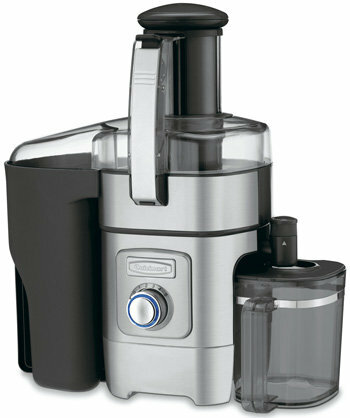 Overall, with the Waring Pro Health Juice Extractor it is easy to make fresh, pure vegetables and fruit juices at home. This unit is highly recommended for its unbeatable price and quality features which promote effortless and efficient juicing process. The extractor comes with an instruction book, a five-year limited warranty on the motor, and a one-year limited appliance warranty. 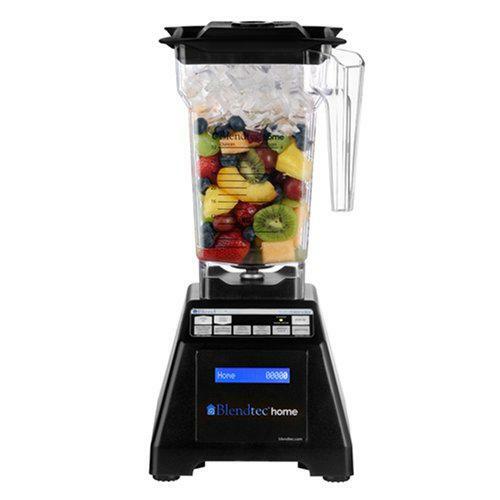 Cuisinart CJE-1000, equipped with a 1000 watt powerful motor and 5 speeds, makes it exceptionally convenient and effortless to enjoy fresh, healthy fruit and vegetables juice. The unit comes with a large 3 inches feeding chute that easily accommodates whole apples, pears or other large size fruits and vegetables. The extra-large items can be cut into reasonable sized chunks and then put in the chute for juice extraction. The adjustable flow spout eliminates drips and spills for a clean counter top. 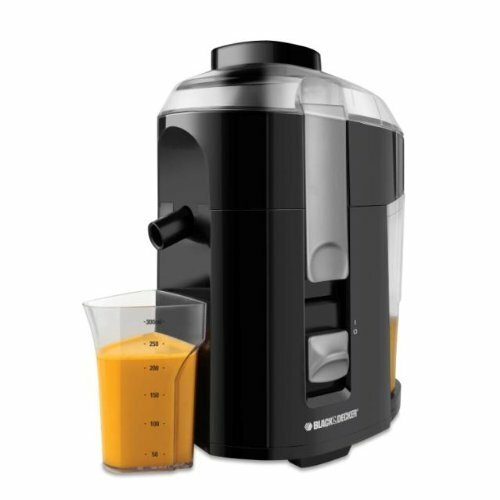 This good looking juicer is housed in die cast and stainless steel featuring an easy unlock and lift system, a filter basket specially designed to reduce foam and high-quality motor that runs very quietly. This unit includes a 2 liter pulp container that makes it easy to discard unwanted pulp and 1 quart juice pitcher for collecting juice to serve or store for later usage. Cuisinart CJE-1000, equipped with a 1000 watt powerful motor and 5 speeds, makes it exceptionally convenient and effortless to enjoy fresh, healthy fruit and vegetables juice. The unit comes with a large 3 inches feeding chute that easily accommodates whole apples, pears or other large size fruits and vegetables. The extra-large items can be cut into reasonable sized chunks and then put in the chute for juice extraction. The adjustable flow spout eliminates drips and spills for a clean counter top. This good looking juicer is housed in die cast and stainless steel featuring an easy unlock and lift system, a filter basket specially designed to reduce foam and high-quality motor that runs very quietly. This unit includes a 2 liter pulp container that makes it easy to discard unwanted pulp and 1 quart juice pitcher for collecting juice to serve or store for later usage. The unit also includes a cleaning brush and all removable parts clean up easily by hand or are dishwasher safe. Some reviewers report that juicer leaves wet pulp from softer fruits like berries. Some users are say that cleaning is tedious due to the many parts or dried up wastage. 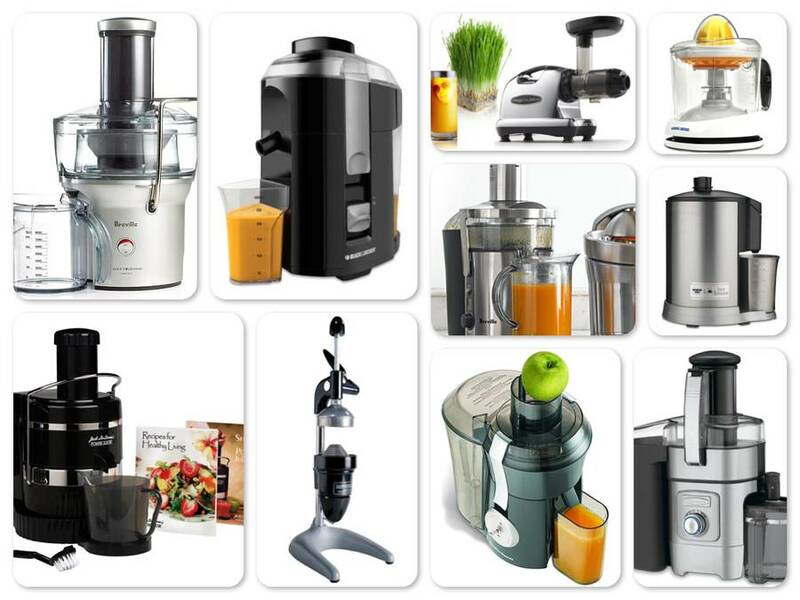 Overall, the Cuisinart Juice Extractor is a desirable centrifugal juicer to enjoy a healthy and nutritious diet in a more comfortable, efficient and effortless manner. This unit is highly recommended for its reasonable price and quality features and is backed with three years limited warranty.